The annual Israeli American Council conference currently taking place in Washington was originally meant to focus on the battle against the Boycott, Divestment and Sanctions movement. But instead, the ongoing wave of Palestinian terrorism in Israel has taken center stage. Other Israeli government officials attending the conference included Justice Minister Ayelet Shaked, National Infrastructure, Energy and Water Minister Yuval Steinitz and Zionist Union leader Isaac Herzog. “Any comparisons made between Israel and the Palestinians... are unacceptable to us,” Shaked said. 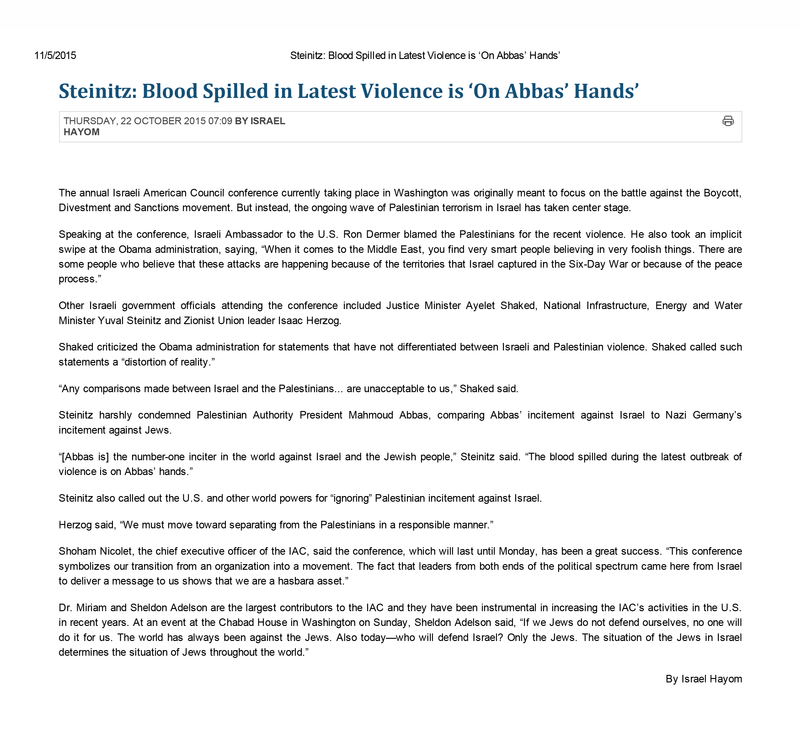 Steinitz harshly condemned Palestinian Authority President Mahmoud Abbas, comparing Abbas’ incitement against Israel to Nazi Germany’s incitement against Jews. Steinitz also called out the U.S. and other world powers for “ignoring” Palestinian incitement against Israel.